The Junkers Ju 87 or Ju 87 was a German light bomber of World War II. It was used as a dive bomber. Its crew was a pilot with a navigator/radio operator behind him. He also handled the rear machine gun. The Ju 87 could drop 500 kg of bombs. 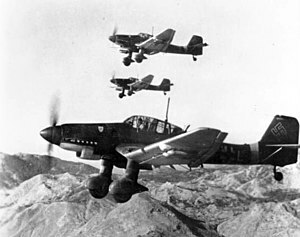 Some Ju-87 were modified as attack aircraft against tanks. More than 6500 were made. It's universally known as Stuka, an abbreviation of Sturzkampfflugzeug, German for dive bomber. The plane was designed by Hermann Pohlmann. It has first flight 17 September 1935. The first time it was used in battle was 1936 during the Spanish Civil War. Junkers Ju 87 attacked Guernica. In World War II, Ju-87 were used for bombing against Poland, and after against Belgium, Netherlands, France, and Greece. By the Battle of Britain Junkers Ju87 were used to attack Dover, Folkestone and other harbours of the English Channel. Early in the war this aircraft became famous for the siren it used to panic people. It was removed when enemy forces became accustomed to it. Many Ju-87 were used in the Soviet Union against Soviet troops. In the Battle of Stalingrad, they were used to bomb the town. ↑ "Junkers Ju 87 Stuka". HowStuffWorks. 19 October 2007. ↑ "The Junkers Ju87 Stuka". www.battleofbritain1940.net.